You are currently browsing the tag archive for the ‘peanut butter’ tag. I made these a week ago. 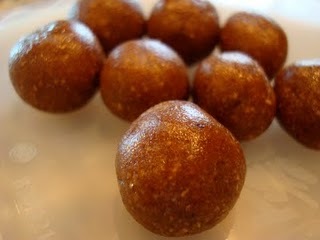 Relatively healthy and easy to make, these candies are best when stored in the fridge, in a Tupperware container. 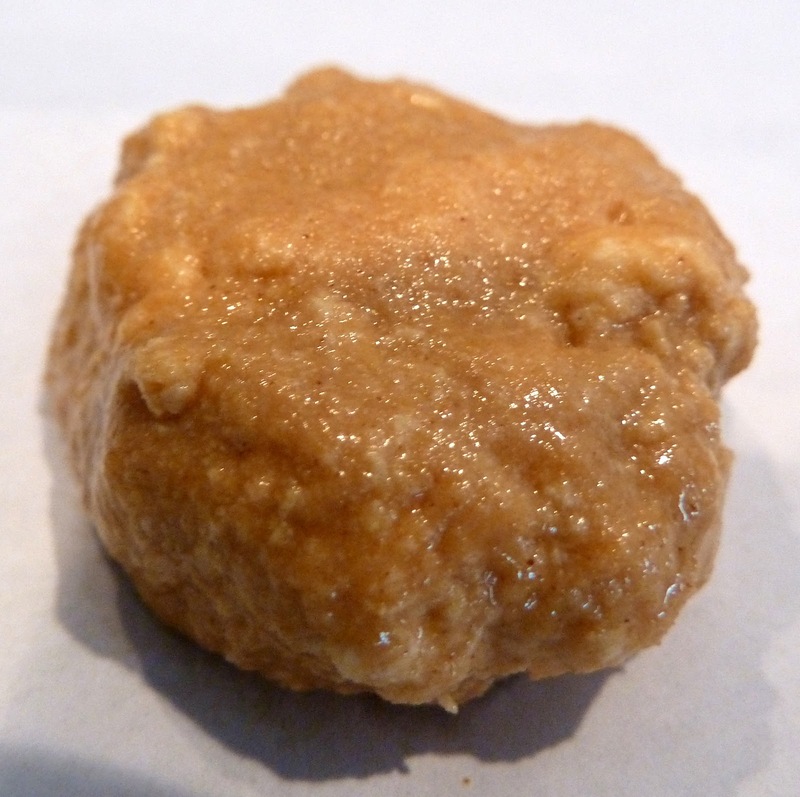 If you don’t have raw peanuts, about 1/3-1/2 cup of raw chunky peanut butter works here, too. For me, the biggest challenge with this recipe is to not let my kid eat more than two-three pieces of this candy a day! Try to find the sour cherries, as cranberries are usually sold sweetened, which is not ideal for this recipe. If you are into peanut butter and jelly, check out this crazy raw mix, too! dried dates, pitted, 1 cup. 1. In large bowl, mash dry fruits with potato masher (make sure to check each date to make sure even the pitted ones are without pit). If mashed dates seem too dry, add just enough hot water to moisten them. You can also use your food processor, if you don’t mind cleaning the sticky dry fruit mix afterwards. 2. Crush the peanuts and mix into the mashed dates and cherries. Roll the mix into balls. Cool in the fridge for about 20 mins before serving. In my quest for how to destroy excess zucchinis, I found a great recipe. My friend, Dr. Johnny Bowden posted the best squash spaghetti recipe ever! If you like Thai food, try my adaptation of it. I added peppers and peanuts, substituted Tamari with Bragg’s and put peanut butter instead of almond one. The peppers make this dish spicy, which I like. Combine almond butter, tamari, and curry powder in large bowl, and whisk until well mixed. Set aside. Trim ends off squash. Using mandolin or sharp vegetable peeler, slice squash lengthwise into long, thin strips. Add squash strips to bowl, and gently toss with peanut butter mixture until well coated. Add coconut, raisins, peanuts, peppers and cilantro, and toss until evenly distributed. Serve immediately, or chill for up to 48 hours. Today I was doing what I like to do best: playing with food. I actually tried to make some edible play dough. All of the recipes for homemade play dough online seemed to be copies of each other and the ones that seemed more original utilized unhealthy ingredients, such as corn syrup, powdered milk and white sugar. As I was testing my recipe (made out of leftovers,) I realized that my edible play dough can also be made into some yummy healthy candy. So, I made candy and my kid and I played and ate: what could be more fun? As a main ingredient, I used cooked amaranth. Amaranth is a grain, which was used by the Aztecs and now is popular in Latin America. Amaranth contaisn large amounts of protein and essential amino acids. Amaranth has 30% more protein than many other whole grians grains, such as brown rice, wheat flour, oats, and rye. Amaranth grains are very small and cooked amaranth is sticky ( this is why I thought of play dough.) Generally, I like to use amaranth as a side dish, as a substitute for any dish, asking for a grain, as a sticky base for a casserole or even as an egg substitute, because of the binding effect it brings to baked dishes. Amaranth works well as a diversion from your morning oatmeal. It combines very well with fruits and vegetables. Even though this recipe contains brown sugar, it is rich in protein, fiber, folic acid, phosphorus, magnesium and zinc, as well as vitamins B, D and E. Perhaps you need to encourage your kids to eat more play dough! Mix all of the ingredients together. If the dough is too watery, add more wheat germ. If it’s too dry, add more almond butter. You can add more sugar of you think it’s necessary for a better flavor. Use my suggestions for homemade edible colors from here. Follow the recipe for play dough. Add 1/2 cup of almond pieces and (optionally) 1/4 cup of chopped dates. Form the dough into balls. Roll each ball in shredded coconut. Refrigerate for thirty minutes and serve. Peanut Butter And Jelly "Truffles"